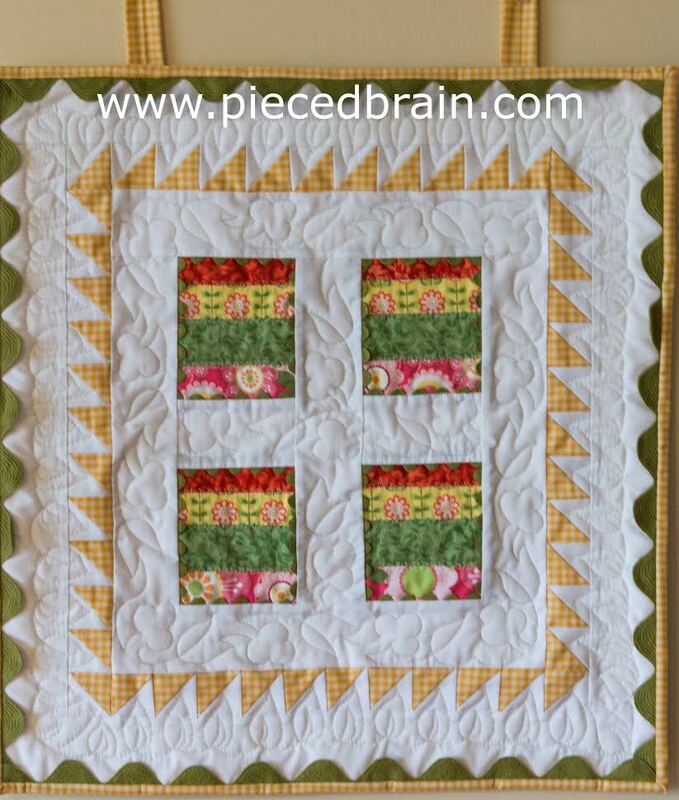 Pieced Brain: Strip-easy: Quilt Challenge! Remember all the strips of fabrics leftover from projects you worked on for years? I have a drawer full of strips of different widths, just waiting to be part of a quilt. Two-and-a-half inch lone strip beauties, remnants of bindings, leftover borders... It is all in there. Every time I cut strips from yardage of fabrics, I almost hear screams coming from that drawer: "I am already cut to size! Don't I go well with those fabrics? Use me now!" Well, here is our chance to engage into major 'strip-[t]easy' and turn those strips into fabulous projects! I am thinking wall hangings, table runners, bags, pillows... anything that will use up the strips you already have from older projects or jelly rolls. This is a terrific opportunity to make gifts for all the special occasions coming up in your life, including Christmas. This wall hanging is called "Windows to my garden". It measures 20" by 22". I started by sewing together the colorful strips - my 'windows'. I only had those four strips, enough for four blocks, and now they are out of the strip drawer. The sawtooth border came from triangles I had cut out from squares in another project (see it here). I stitched them into HSTs, and the border fit 'perfectly' around the middle blocks (how often does that happen?). My next project is ready to be quilted and you will see it soon. What do you say? Just leave a comment letting me know you are in! Okay, I am in. I have strips. I have next to no strips! I don't really quilt, so I have lots of scraps, just no strips. :( I can't wait to see what everyone makes! Absolutely! It seems like I have been making string quilts since January and the string bowl is still no less full! It will join you too!!! Should be fun. I have a rubbermaid box full of strips that would make great NICU quilts for project Linus. Sew, count me in!! 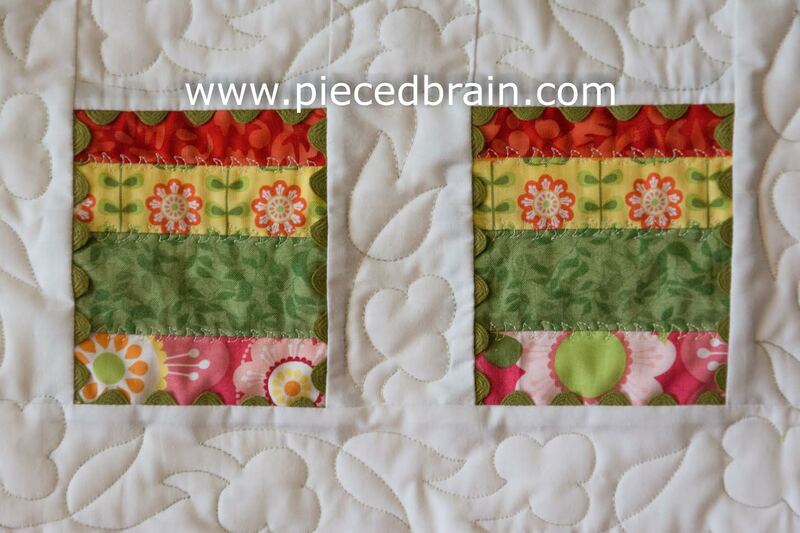 I have a couple of small quilt commitments coming up and this will be a great incentive to use strips instead of cutting into new fabric. Count me in. That sounds like great fun, I'd love to join! I'm in! I do have a bunch of strips and a desire to clean out my storage! Perfect timing Denise! I have a handful of leftover strips I am incorporating into a lap quilt right now. So count me in! Thanks. I don't know what I'll be making but I definitely have the strips! Great project idea Denise, I'm in! Okay Denise I am joining in on this blog hop. I don't have a drawer full of scraps, but I have scrap bags of every color and yes indeed they are stuffed full. 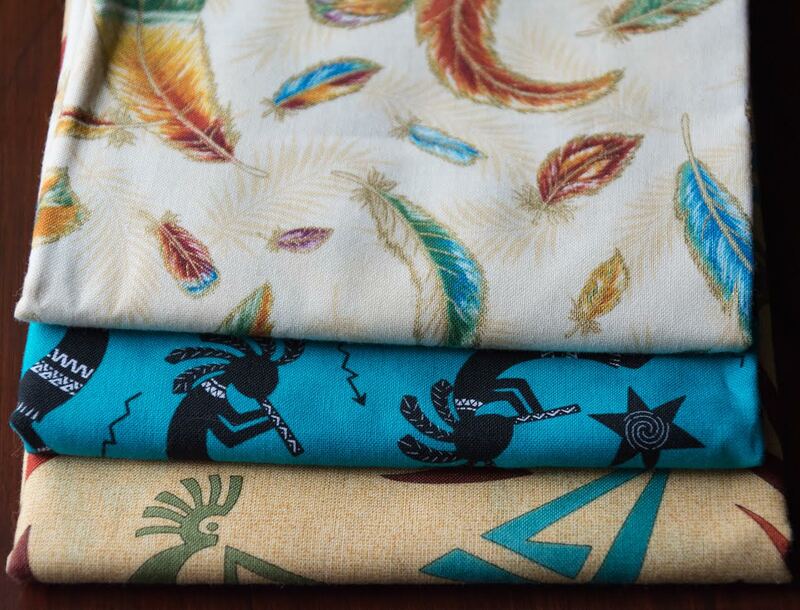 Oh and Kokopelli fabric and Aurifil thread are great prizes! Kokopelli is perfect for me since I live in New Mexico, lol!!! I say Hell yea ! I love working with my scraps and I am pretty constant about it too.. Sounds fun to me so yes I'm in. Now all I need is a good idea! Count me in too....strips I have....in a box...in a bag...everywhere....so thank you sweet Denise...this is perfect! I have a whole bag of strips. What I am wanting to try with them is a spiderweb quilt. Yes, I think I can do this! I have lots of strips! I don't really have many strips in my scraps. I like selvedges. Do they count? I am just getting into doll sized things so I am sure I can come up with something to join in. Thinking on this one! I don't have a blog so may I still play? I'm late to the party but your challenge still inspires me. My strip bin is over flowing - literally. I had to move them from a pretty basket to a plastic tub! And that's just the leftover bits - not counting unopened jelly rolls. I know - I may have a problem :) I'm excited to see all the finished projects and dive into that bin!